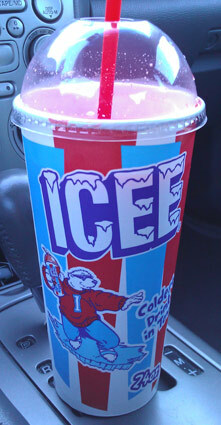 And that's how I wound up drinking wild cherry ICEE all the way home. Ironically... or maybe as expected, I only drank 2/3 of it (also know as a small). It's only a waste if you paid extra... oh crud. Technically that wasn't the only treat I had today. A very nice lady who's directing this weekend's project offered to bring me back lunch. I said thanks! She followed that thanks with "don't worry, we'll bring you back something good". Hmmmm, I think I may be a little afraid. So they come back from lunch and start to giggle as they let me know my lunch is in my office. I should have moved the pickle so you could better see the foot long Kobe dog infront of you. My word, I know I don't get out much, but I have never seen a hotdog that big or that fancy. The exact description is "Cheddar Cheese / Red Onion Tomato Relish / Pickles & Peppers / Coleslaw / Brown Mustard on Grilled Brioche Bun" and I must say it was quite tasty. 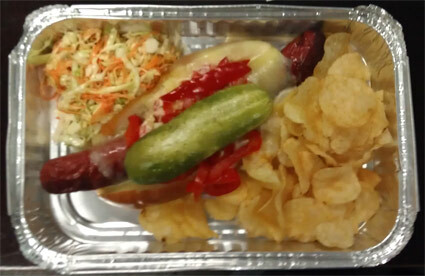 I did remove some of the peppers (and the pickle), but it was by the far the most gourmet hotdog I've ever had. Is this what cool people do for lunch? I knew I was missing something! Ok, TV time. I'll leave you with ICEE Bear-Man (a cheezy version of pac-man). Update: I forgot to mention I only are half the dog and all the chips. I reheated the other half on Sunday and it was still quite tasty. What are your plans for National Ice Cream Day, Dubba? Personally, I'm solo-slamming a pint of Ben and Jerry's.